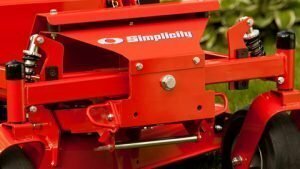 Simplicity® Tractors and Zero Turn Mowers are sold exclusively through independent servicing dealers who give you the professional experience, expert advice, parts and service that you deserve. Designed with the operator in mind, Simplicity® Mowers offer ergonomic, easy to use controls and innovative features to make your mowing experience even more enjoyable. 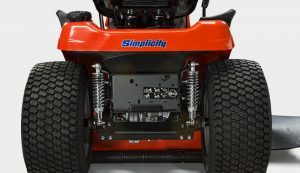 Taking your mowing comfort to the next level, Simplicity® owners can enjoy a smooth ride with suspension on many models while still achieving a premium cut. 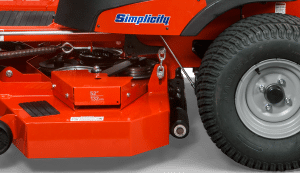 Many Simplicity® Tractors and Zero Turn Mowers offer a complete suspension package – the Suspension Comfort System™ – comprised of suspension, a high speed transmission and a comfortable mesh or commercial-grade seat. 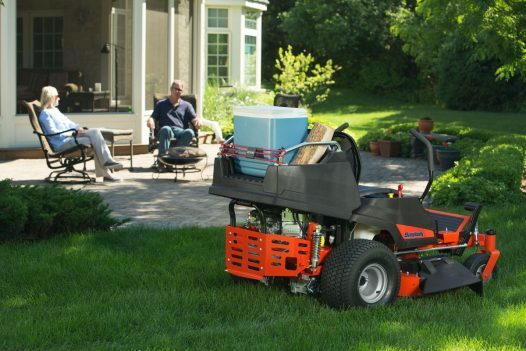 A Free Floating™ Mower Deck, pivoting front axle and full-width rollers on Simplicity® Tractors work together to create a beautiful lawn, resulting in a scalp free velvety cut. 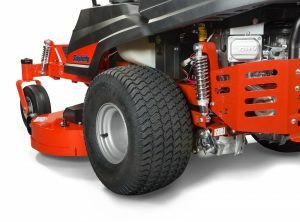 The full-width rear rollers lay the grass down in the direction the mower is traveling to create professional ballpark-style striping patterns. Here we’ve listed some of the key features that make Simplicity what they are. 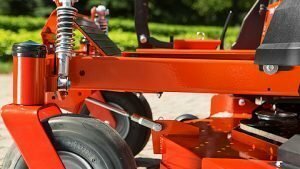 This exclusive system lets you quickly remove your mower deck with no tools, so you or your mower dealer can easily keep your blades razor sharp for a beautiful lawn. You’ll have full access to the underside of the deck for routine cleaning and maintenance. Plus, the Quick Hitch™ systems allows you to remove the mower deck when using attachments or fitting your tractor through tight spaces. 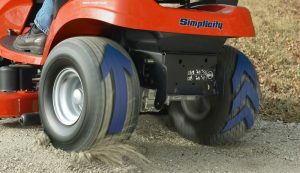 Simplicity mower decks move independently from the lawn tractor for a superior cut, and they ride on top of full-width rear rollers, which constantly move up and down, allowing the blades to maintain the precise cutting height selected by the operator. 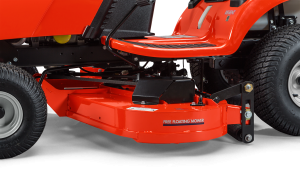 As the pivoting axle and the full-width rear rollers respond to changing yard contours, so does the mower deck. The result is less scalping or unevenness. When you add in Simplicity’s computer-optimized airflow and super-sharp blades, you get the best cut on the block. And Simplicity’s unique mower deck can also give you something else – beautiful lawn striping effects. When the Simplicity full-width rear rollers pass over the freshly cut blades of grass, they bend them forward slightly, and when the sunlight reflects off of the bent grass, something magical happens: the grass in rows angled toward you appears darker in color, and the grass in rows angled away from you appears lighter. Click here to view a Free Floating Mower Deck video demonstration. Compared to traditional mowers without suspension, the Simplicity Suspension Comfort System offers a mowing experience with 25% less impact felt by the operator*. Simplicity lawn tractors are built to last with durable components – all-steel hoods and seat pans, long-life engines, transmissions and serviceable arbor and shaft assemblies. Attachments make yard work easy. 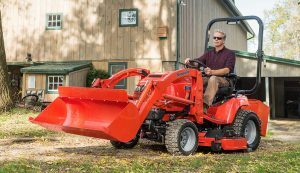 From single stage and two stage snow blower attachments to grass catchers and tiller, attachments are the easy way to do more with your Simplicity® Tractor. Zero turning radius for cutting both tight spots and large open lawns, quickly and easily, leaving a beautifully cut lawn behind. Rear deck rollers leave behind beautiful lawn stripes. When the Simplicity rear deck rollers pass over the freshly cut blades of grass, they bend them forward slightly, and when the sunlight reflects off of the bent grass, something magical happens: the grass in rows angled toward you appears darker in color, and the grass in rows angled away from you appears lighter. 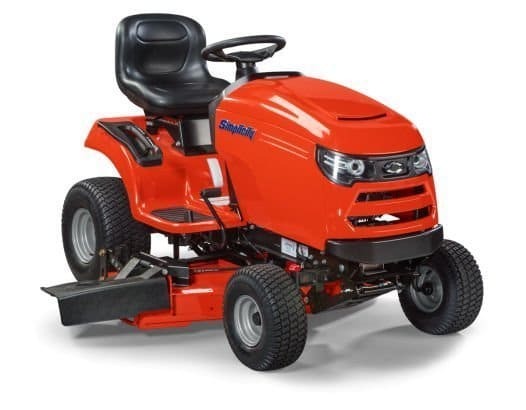 Simplicity offers comfortable commercial-style mowing with a front- and rear-wheel patented suspension system for increased mowing productivity, along with a comfortable high back seat, adjustable steering levers, convenient controls and padded footrests. 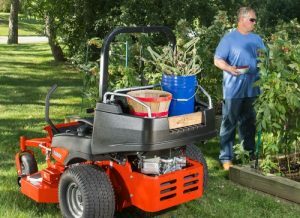 Fully-welded steel frame, thick-walled pivoting front axle, durable mower deck and ball bearings in the castor spindles ensure durability and a quality cut for years to come. The pivoting front axle is equipped with ride-damping front shocks that offer hours of comfortable lawn mowing. It also keeps the wheels on the ground over uneven terrain, which results in a smoother cut. Integrated cargo bed offered on select Simplicity Courier and Simplicity Contender models make these mowers versatile work horses in a category of their own. Check out what these Simplicity owners have to say about the Simplicity experience. 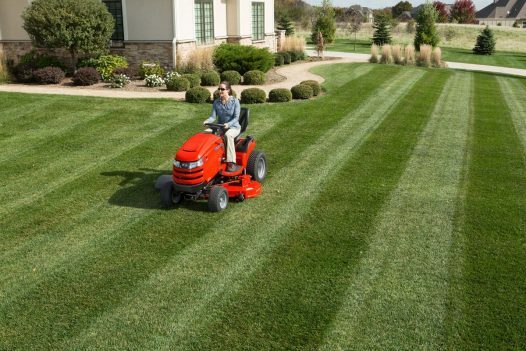 Wenger Equipment is your local Simplicity lawn mower dealer for central WI. If you are looking for a new lawn mower or if you have one that needs service or parts contact us today. We have over 30 years of experience helping customers just like you select the right equipment and keep that equipment running for years of dependable service.